Malta is a country with a small land mass so large stock holding farms were always rare, consequently rabbit became a popular source of protein. 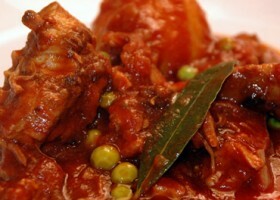 Stuffat Tal-Fenek or, Maltese rabbit stew, is a succulent slow cooked dish: the meat so tender it falls off the bone. Maltese families love to use the rich tomato sauce with pasta as a first course and serve the rabbit with vegetables as a main. One dish, two courses! In a large pot, heat the olive oil, and add the rabbit pieces, turning until slightly brown. Add the onions, carrots, potatoes and the tomatoes + tomato puree, and pour half of the marinade on the ingredients.